The proposed Innovative Space Vehicle for the European Space Agency is shown with human workers for size reference in this artist's interpretation. A European-built robot space plane could be soaring in orbit before the end of the decade if the program to develop it gains funding approval next month. The Innovative Space Vehicle (ISV) would be Europe's civilian equivalent of the U.S. Air Force's unmanned X-37B Orbital Test Vehicle, a robotic miniature space shuttle that has flown on two missions since 2010. The unmanned space plane would be much smaller than the Air Force vehicle, however. Its fate rests with the European Space Agency’s ministers, who are scheduled to meet Nov. 20-21 in Italy. The ESA ministerial meeting is conducted every three years to decide programs and funding for the period until the next meeting. PRIDE (the Program for Reusable In-orbit Demonstrator in Europe) will be seeking funding there for the ISV, which would be a follow-up to its Intermediate Experimental Vehicle (or IXV), currently being built after months of delays. This concept graphic shows one possible configuration of the Innovative Space Vehicle and its various orbital flight mission phases. The PRIDE-ISV would launch from Guiana Space Center in Kourou, French Guiana, aboard an Arianespace Vega rocket. Vega is the smallest of the ESA launchers, which would force PRIDE-ISV to be small, too. The rocket can put 3,300 pounds (1,500 kilograms) into a 434-mile (700 kilometers) circular polar orbit. "We started from our current IXV but went from suborbital to orbital and modular payloads and a multipurpose cargo bay for different orbital applications," Giorgio Tumino, the IXV program manager, said. Tumino acknowledged that reusability and reliability would both be challenges for the PRIDE program. "The idea is to have a small system, which is affordable to be refurbished and can use the smallest launcher, to have a cost-effective scenario." The 3,970-pound (1,800 kg) IXV, which is due to fly a suborbital mission in 2014 as a re-entry test vehicle, is smaller than the U.S. Air Force's X-37B space plane. It is heavier than the Vega's 434-mile orbital lift capacity, thus requiring suborbital tests or a potential lower target orbit. Because of Vega rocket requirements, the ISV will be of a similar size to IXV. Tumino’s team investigated the feasibility of PRIDE-ISV and assessed various configurations while working with the ESA’s Concurrent Design Facility. "We carried out a parametric assessment of what is doable, and that is what our proposal is based on," Tumino said. European Space Agency’s Intermediate Experimental Vehicle, a robotic space plane prototype, is shown under construction. Among the assessments was the mass constraints of the small European launcher and whether the robot space plane could reach a range of orbits. One constraint is the Vega’s fairing volume. "We have to think whether we have fully deployed wings or foldable" inside the fairing, Tumino explained. "It’s a trade-off against cost." The work determined that the small launcher could put the PRIDE-ISV in orbit, and with future planned developments of Vega, the space plane could be launched to orbits from zero degrees (a polar orbit) to 90 degrees in inclination with respect to the equator. Tumino said he is open to international development for PRIDE-ISV, adding that the Japan Aerospace Exploration Agency is one possible partner. CIRA, an aerospace agency in Tumino’s home country of Italy, also could become involved. 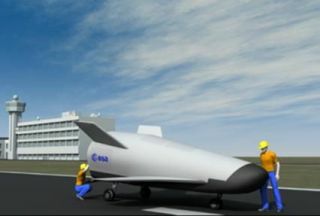 A robotic space plane called Unmanned Space Vehicle-X has been proposed at CIRA but has not been funded. While Tumino hopes for PRIDE-ISV to be funded, his IXV industrial team is now building the flight vehicle. While manufacturing and assembly contracts were signed at the 2011 Paris Air Show, the lengthy negotiations between the contractors and their subcontractors led to the flight being put back from 2013 to mid-2014. The IXV program has more than 30 contractors. The IXV mini-shuttle vehicle has four thrusters and two body flaps at the rear to provide flight control. It is described as a lifting body because its shape produces lift without the need for wings. The flaps are used for pitch control, which determines whether the nose of the shuttle goes up or down, during re-entry. When the IXV launches on its first test flight, it is expected to soar into orbit from French Guiana and splash down in the Pacific Ocean 2 1/2 hours later using parachutes. The robotic spacecraft is expected to re-enter the atmosphere at more than 20 times the speed of sound. By performing maneuvers in the atmosphere during descent, the spacecraft should be able to slow itself considerably, to about Mach 2. Parachutes should then be open to slow the craft even further for a water landing. The parachutes already have been tested successfully. Follow SPACE.com @Spacedotcom. We're also on Facebook and Google+.